DHAKA, Jul 26 2011 (IPS) - Jasinta Nokrek loves nothing better than to range through the dense Modhupur forest, the way her Garo tribal ancestors have always done. But these days there is grimmer work. She and her neighbours and friends have been charged with keeping a vigil against illegal logging. Officially, the women are members of a Forest Resource Management Group (FRMG) formed to protect the Modhupur forest, located some 150 km northwest of the capital in Tangail district, from poachers and loggers. Jasinta, a leader of one of 15 FRMGs working to protect demarcated areas extending about 45,000 acres of the reserve forest, explains that each group functions on a self-help basis with its members drawn from different communities. The FRMGs are the creation of a number of national NGOs focused on establishing good governance. Members meet once a month to discuss and record their work. Two years ago the situation prevailing in Modhupur was different, with the Garo tribals on the defensive in their own stomping grounds and living in fear of armed poachers and dishonest forest officials. Physical assault and even murders forced the peaceful Garos to avoid interfering in the large-scale felling of sal (shorea) forests for the high quality timber that fetches good prices in the cities of Bangladesh. Corrupt forest officials were known to implicate the local inhabitants in cases of illegal logging, trapping the Garos in long and costly legal battles and leaving them incapable of resistance. The Garos, who live mainly on cultivating fruits and spices, were slowly but surely being marginalised in their ancestral lands. Moreover, from the state’s point of view they had no legal title or claim to the forests. What saved the Garos and the forests was an initiative launched some 18 months ago by the Bangladesh Environment Lawyers Association (BELA) which supported efforts to narrow gaps between the tribals and officialdom. After months of mediation involving NGO representatives, the local government and forest office began recognising and respecting all FRMG initiatives towards protecting the forest and environment. “Our relations with forest officials have never been so pleasant. We maintain full cooperation with the forest department in conserving the natural forests,” said Jasinta. Importantly, all private or government programmes in the forest must now have prior written approval of the tribal leaders. As the tribal leaders asserted themselves a project to wall off 27 acres of forest land in the name of building a so-called eco-park was halted. “There was a time when the forest department officials did not care to discuss with us what the government planned to do with certain projects. They never even recognised our rights to live in the forest,” said Ajoy Mree, head of the indigenous people’s forum in Modhupur forest. Empowering the tribals began as early as in 2006 when a network of leading national NGOs like BELA, Neejerakori, BLAST, Action Aid, and Ain-O-Shalish Kendra formed the Association of Land Reform Development to help the tribal people. The NGOs, with specialisation in different areas, trained the local people in matters related to land reform, judiciary matters, forest laws, human rights, national policies on indigenous people and their habitation. 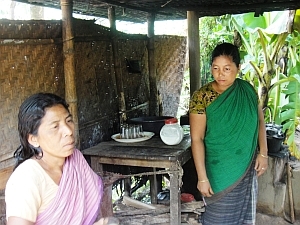 While the other NGOs completed their missions and left, BELA continued to pursue its advocacy and in June 2007 launched a special campaign to organise a series of meetings, seminars, and workshops to build awareness on forest laws and indigenous people’s rights. BELA’s chief executive Syeda Rizwana Hasan told IPS: “In order to restore the forests, BELA thought of a process involving the forest dwellers and demanding changes in the forest governance regime”. As BELA worked to form a strong network of social monitoring through increased understanding, other people became more aware of their rights. “We believed that knowing the laws and their rights was the main tool for the tribals to fight off intruders and so we focused on empowering them, especially the women,” she said. “One reason to involve the women was because many of the men had been labelled as ‘offenders’ with false cases registered against them for chopping trees,” said Samnath Lahiri, BELA’s senior research officer working with the native leaders. “Now that we are better equipped with knowledge of forest laws and our rights intruders can no longer fool us like they used to do before,” Maria Chirang, a member of an FRMG, said. The advocacy programme on laws and rights of the native people has been so effective that tribals and officialdom now coordinate with each other for strengthened vigilance. Decades of illegal commercial logging have, however, reduced the Modhupur forests from its original 60,000 acres of dense woods to less than 45,000 acres, forest officials admit. Across Bangladesh the forest cover has come down to an alarming six percent from 16 percent over the last 20 years. This is not surprising considering that Bangladesh has 1,142 people per sq km making it one of the most densely populated countries in the world. Along with rapidly shrinking forest resources many wild animals have vanished as also the natural habitat of many insect species, threatening ecosystems in the region. Rajesh Chakma, assistant conservator of forests in the Modhupur range, admits that there are real benefits accruing from recognising the rights of the Garos, who number some 30,000. Garos, a matrilineal tribe, straddle the hilly border between Bangladesh and India’s northeastern states and are estimated to number 2.5 million in all. “We extend regular cooperation to the FRMGs in monitoring any offence and ever since the groups became functional poachers have become scarce,” Chakma said.